I’d never found an email client that might woo me away from Apple’s Mail ( ) until I came across Arcode’s free Inky. This cleverly designed app seems built around the way most people use email every day. On startup, Inky prompts you to set up an account for Arcode’s cloud-based service. You can then add details for any email accounts you own: IMAP, POP, or webmail. 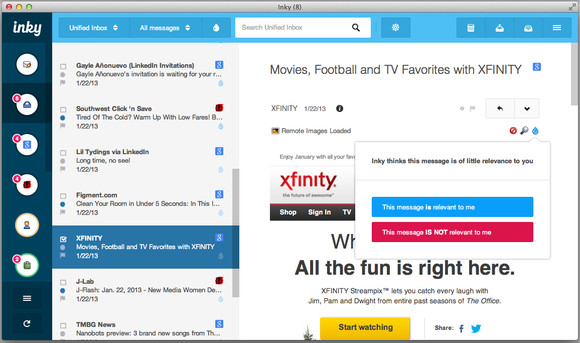 With only an email address and password for each, Inky set up two different email accounts in seconds. I appreciated how the program kept me informed as it figured out how to configure itself appropriately. Inky learns to predict how much each message might mean to you. An email client that processes your mail through a third-party cloud service could understandably raise privacy concerns. The company takes pains, on its website, to dispel such worries. According to Arcode, Inky lets your computer connect to your email provider(s) and store messages—Inky doesn’t store or transmit your mail through the Arcode servers. It does hold your email accounts’ details and passwords, but they’re stored encrypted, with the only key being your Inky account password. Arcode says that as a result, none of its employees could ever gain access to your email. On the plus side, Inky’s cloud-based approach offers considerable convenience. You can install Inky on as many different computers as you like, accessing multiple email accounts through a single convenient login. Inky even integrates seamlessly with OS X Mountain Lion’s Notifications Center feature to let you know when new mail arrives. The first time I used Inky after configuring my accounts, the app promptly displayed messages from a POP account, but initially showed nothing from my much larger, IMAP-accessed Gmail account. I saw only the cryptic message “Loading…” I closed the program and returned hours later to find all my mail present and accounted for—evidently the delay was due to the size of my Gmail archive. I would’ve appreciated a more-detailed progress report. Inky’s clean, logical interface provides a lot of power with minimal clutter. Icons on the left let you view different accounts or open the program’s settings. Proceeding rightward, you’ll see your message list, then a preview of the selected message or conversation. A clever guided tour lets you interact with the program’s features as you learn them. You can easily customize that layout from a configuration menu at the top of the screen, alongside a search bar and menus that let you filter and sort whichever message list you’re viewing. For example, you can quickly filter the view to show only large messages, only messages with attachments, or only messages to which you haven’t yet replied. A final menu can quickly rearrange your message list by order of relevance (more on that shortly), date, time, subject, author, or size. From the Settings screen—Inky has no conventional Preferences window—you can turn on Smart Views. Inky will recognize messages from folks in your address book; social networks; daily-deal sites such as Groupon; any messages that offer you the option to unsubscribe; notifications of packages en route to you; notes you’ve sent to yourself; or messages containing mappable addresses. 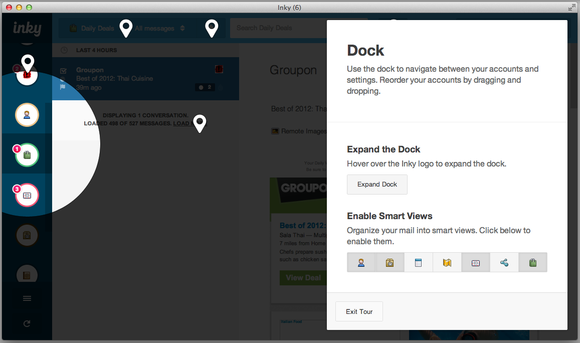 You can toggle separate views for each of these categories at will. In my tests, this feature worked flawlessly. Inky also provides relevance rankings. Over time, the program learns which messages you care about most, and can display those at the top of your list. For example, it knows that a message from your parents likely takes priority over a coupon for two-for-one falafels. An accompanying water-drop icon grows more vivid or faint as a message grows or diminishes in relevance. You can also manually tell Inky which messages matter more or less to you, and the program will remember your choices. Right out of the box, Inky did a respectable job of guessing which messages were likely the most important to me. Inky does its best to lay out all these options in a clear, eye-pleasing manner. Help tags and an initial guided tour help steer you around. Though I didn’t instantly grasp every facet of Inky’s interface, I rarely suffered more than a few seconds of confusion. Inky has no help system, but the program is well-designed enough to compensate for that omission. Inky can automatically detect and categorize common message types, including package-delivery notices and daily deals. Aside from occasional mild sluggishness in showing a message, my only real complaint about Inky involves its self-promotion. By default, it appends a tiny text ad for itself to all outgoing messages, although you can delete this signature in Settings. It also periodically bugs you to tell your friends about Inky; if you accept, it leads you to a slick, built-in messaging engine that uses your address book. I suppose it’s not quite fair to complain about these occasional intrusions, since Arcode’s giving Inky away for free. Inky has no calendar, to-do lists, or other auxiliary features, which likely makes it less than ideal for business use. But its sharp design, smart features, and overall plucky cheerfulness won me over. Mac email users should definitely give this fun, full-featured, and free program a try.